Happy Wild About Books Wednesday! My little blog series returned last week for some Halloween fun! Halloween is one of my favorite holidays and there are so many great books that I want to share with you this month! Make sure you swing by my blog each Wednesday in October for some treats! 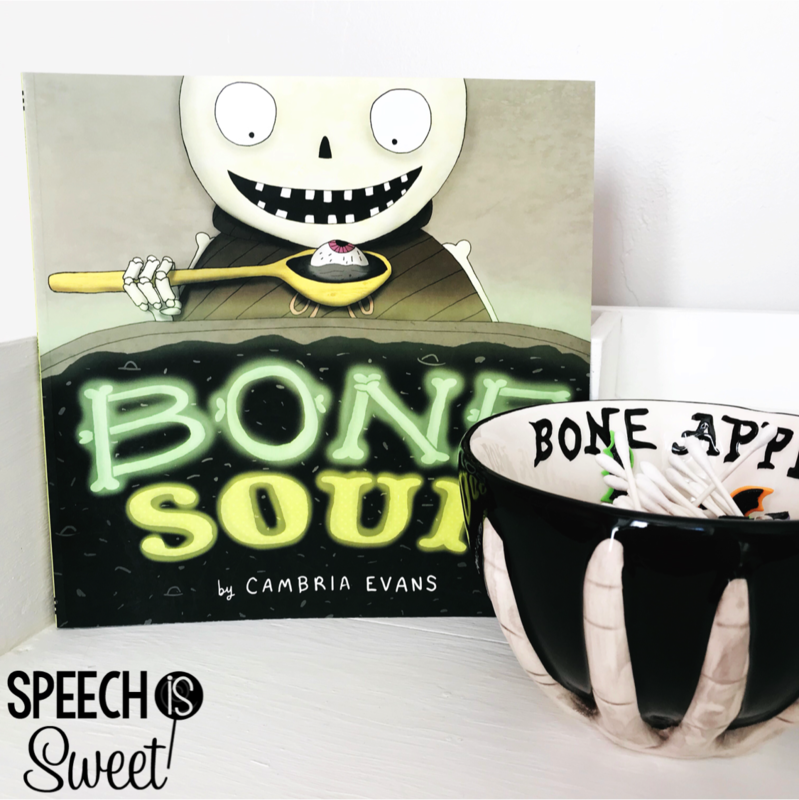 This week’s book is Bone Soup by Cambria Evans! 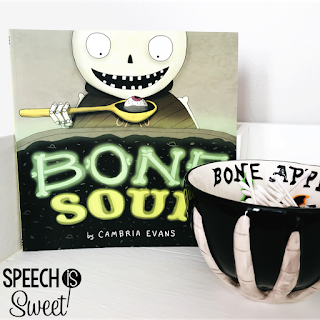 This is a fun Halloween twist on the classic story, Stone Soup! Finnigan is a hungry little skeleton! He roams city to city and has developed quite the reputation for his huge appetite! One Halloween, Finnigan wanders into a new city and is delighted at the thought of a Halloween feast. He is spotted by a witch though, who warns the town of Finnigan’s arrival. Everyone hides their food! Finnigan is disappointed that the town isn’t having a feast and goes door to door asking for food. He’s rejected everywhere! He doesn’t get discouraged though, instead he starts boiling a soup in the town’s square. The townspeople (zombies, mummies, monsters, and the like) all gather around Finnigan’s cauldron in awe. Finnigan convinces them all to add their own ingredients! It’s a delightful story and students will get a kick out of all the spooky ingredients (bat wings, eyeballs, and spider eggs!). 3. Social Skills – Finnigan was not greeted nicely when he entered the town. You can talk about meeting new people and how to be polite. At the end of the story, everyone came together! This is also a great book to talk about making new friends! I also found this bone bowl at Michael’s! I snagged it for 50% off! It’s the perfect companion for this book! 5. Rhyming – Finnigan chants a bone soup poem that gets everyone’s attention! 6. Problem Solving – Finnigan was hungry, but nobody wanted to share their food! How did he solve his problem? 8. Predictions – What will Finnigan do when he goes to the next town? This is truly more of an inference, but this is a great story to make predictions throughout! 9. Compare/Contrast – Compare this story with Stone Soup! You can also compare/contrast all the different ingredients or chicken noodle soup vs. bone soup! 10. Text-To-Self Connections – Students can talk about their favorite kinds of soups and come up with their own recipes! Have you used this book in therapy? What skills did you work on? This is truly a great book! P.S. 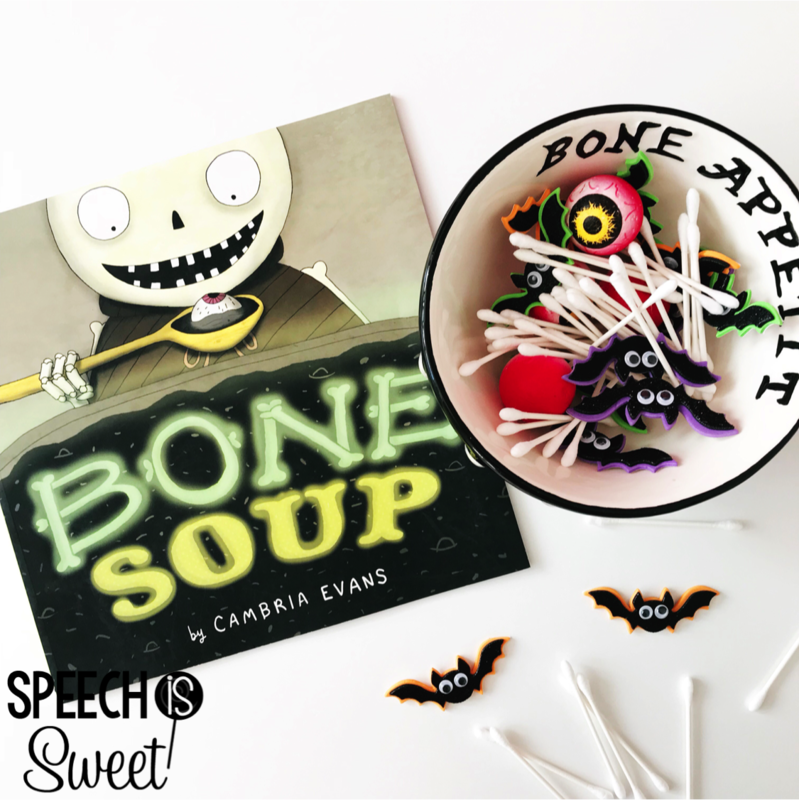 Interested in weekly updates from Speech is Sweet and an exclusive freebie library? Subscribe to my newsletter by clicking HERE!